Last year, during my re-watch of Next Gen, I viewed The Big Goodbye and realized how much I wasn't onboard with all the fan fervor. Today, I happened to see that it was the 26th anniversary of the first airing of this classic episode so I thought, "Why not give it another shot." After an entire year of Star Trek, I figured my feelings about the episode might have changed. Maybe, since I'm feeling all nostalgic about Star Trek in general and about my blog in particular, I'll get the warm cuddly feelings most people associate with this episode. In fact, that didn't happen. I watched this one and, once again, I just wasn't enchanted in the way I'd hoped. Yes, I love Patrick Stewart strutting about in a trench coat and fedora and Gates McFadden is stunning in her little pink ensemble. But the episode itself? It just didn't work for me... again. I think the reason for this is that I either didn't see this episode the first time around or I saw it and was just too young to appreciate it. By the time it came around again, I'd seen this episode's tropes over and over--only by then they were better done. TNG originated the "holodeck gone berserk" episode but they didn't perfect it until later and both DS9 and Voyager followed their lead with even crazier, more ridiculous holo-adventures. I much prefer Moriarty's holo-crisis story in Ship In A Bottle to this one as well as DS9's similar offering Badda-Bing, Badda-Bang. The Voyager crew basically spent 90% of their time in the holodeck so they, of course, gave us lots of these stories and the black and white Bride of Chaotica might be the most daring. The Big Goodbye will probably never win my heart but that's alright. It set a precedent for some of the funnest, craziest romps in the Star Trek franchise. I liked the Dixon Hill episodes okay….definitely better than TOS’ “Piece of the Action” -! Crusher and Guinan were fun to watch. Would have enjoyed seeing more of Janeway and Michael the bartender in “Fairhaven.” My all-time favorite holodeck program was Vic Fontaine’s Vegas lounge. I think your reasoning might be dead on. 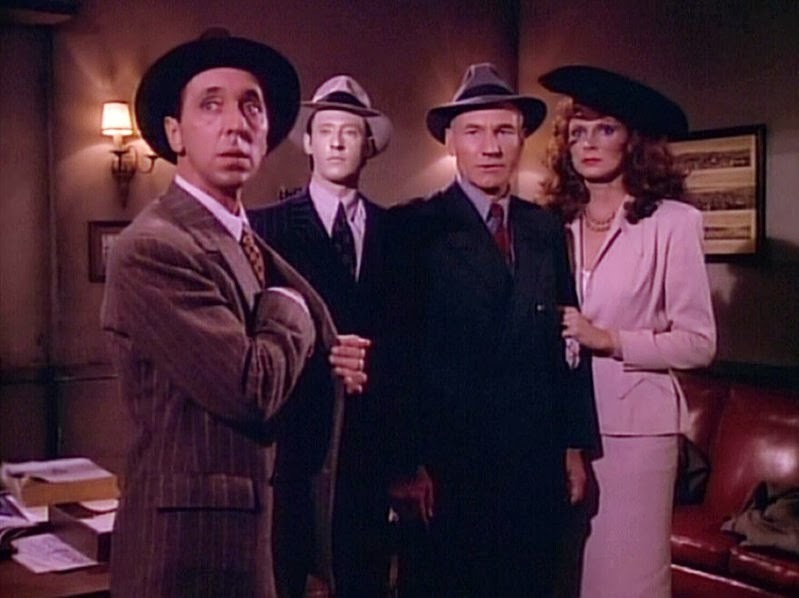 This was basically the "first" holodeck episode, except for a few glimpses seen previously, so it was a brand new thing. At the time, it was outstanding in how different it was. But if you had missed it and only saw it years later, it can't help but lack in comparison to some better romps.